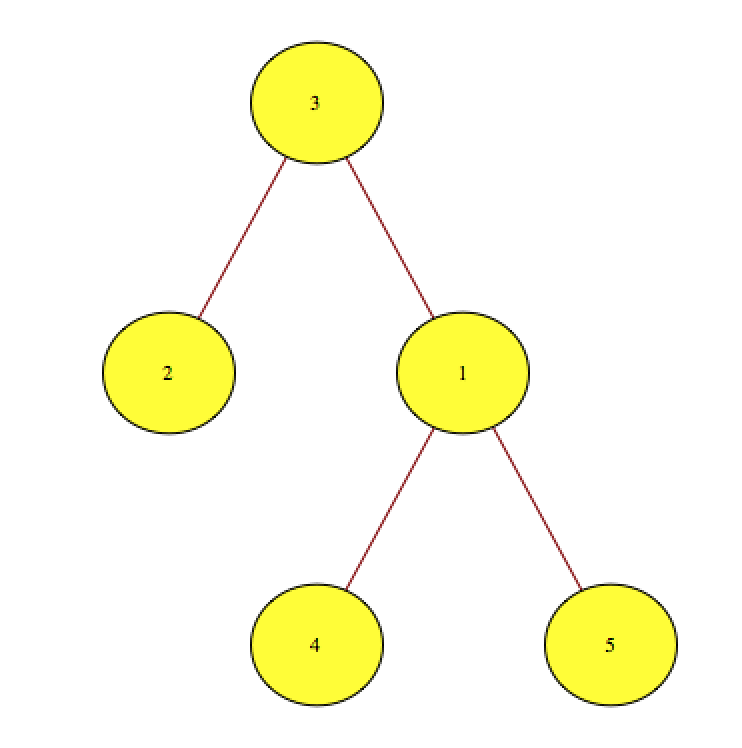 Given a tree where each node is labeled from 1 to n, can you find the number of similar pairs in the tree? The first line contains two space-separated integers n, (the number of nodes) and k (the similar pair qualifier), respectively. Each line i of the n-1 subsequent lines contains two space-separated integers defining an edge connecting nodes Pi and Ci, where node Pi is a parent to node Ci. Print a single integer denoting the number of similar pairs in the tree. The similar pairs are (3,2),(3,1) ,(3,4), and (3,5), so we print 4 as our answer. Observe that (1,4) and (1,5) are not similar pairs because they do not satisfy abs(a-b) <= k .
If any problem, feel free to comment or contact. First we need to traverse the tree using DFS so we need the root node and obviously the node which has no parent is the root node. Now as we traverse each node we will store it in a data stucture to keep track of all the ancestor for the next node but before that get the number of its own ancestors in the range [presentNode-T, PresentNode+T] and add it to the total pairs. 1. Insert a node as we travese the tree. 2. Remove a node as we return back. 3. Give number of nodes within the range [presentNode-T, PresentNode+T] which it have stored. All of the above 3 operation needs to be done in log(N) time because N<=10^5 so we can take up our complexity to O(N log(N)). Binary Index Tree (BIT) is the a data structure which fulfills all of the above condition (There are other data structure like Segment Tree which can also be used). Depth First Search (popularly abbreviated as DFS) is a recursive graph searching technique. While doing a DFS, we maintain a set of visited nodes. Initially this set is empty. When DFS is called on any vertex (say ), first that vertex is marked as visited and then for every edge going out of that vertex, , such that is unvisited, we call DFS on . Finally, we return when we have exhausted all the edges going out from . One may note that recursive calls imitate stack push and pop. Hence, DFS can also be implemented using stacks. In cases where the system stack size (which is used for recursion) is very limited, one might use a user-created stack to perform DFS within the memory limits. The above code provides a good angle to view at the complexity. Under no circumstance, DFS will be called twice on a node. For every node, we have iterations equal to the degree of that node. Hence the time complexity is simply sum of degrees of all the nodes which is . If DFS is called on a node , and there exists a path then DFS will definitiely visit . This can be proven as an induction on the path length of by observing that DFS indeed visits all nodes which have a direct edge from the first node and hence establishing the base case i.e. for path length = . DFS is probably the most used graph-algorithm in programming contests. Many of the standard applications include – searching, counting connected components and their sizes, providing a useful way to number the vertices of a tree, finding bridges, finding euler path/tour and many others. We’ll discuss about numbering the vertices of a tree. Assume that you have a rooted tree and called a DFS on the root. Now, consider any arbitrary call the DFS makes, say its on node . Now, you can notice that DFS first visits all the nodes in ‘s subtree and only then visits any other node. Hence, if we number the nodes in the order they are visited, all the nodes in a particular subtree will come under a contigous range. This kind of numbering is useful for questions which ask to modify all nodes in a particular node’s subtree. Doing this converts the problem to a range modification one which are pretty standard.